I was surprised to see Onmyoji released under Pioneer's banner. The film had been a pretty big hit in Japan, and I assumed someone like Miramax would pick up the live-action film for an art house/indie film release, like Ringu or Bend it Like Beckham. However, I won't mind one bit if Pioneer picks up some of the slack and brings some more of these niche titles over to the U.S. Unlike the period films (jidai eiga) that most of us Americans are used to seeing, Onmyoji doesn't concentrate on samurai or ninja; instead the focus is on an earlier age in Japanese history, the Heian period, the last major period of peace in Japanese history before the sengoku jidai, the Warring States Period. During this period, known as Japan's classical period, the emperor was in control of Japan. The court at Kyoto was colorful and had more ties to the culture of mainland Asia than found in later Japanese culture. A major figure in the court was the cross between an adviser and a shaman. The onmyoji did everything from warding away evil spirits to fortune telling and calculating calendars and times. The major figure in Onmyoji is Seimei (Mansai Nomura), a talented onmyoji at the court. He's light and carefree, but extremely gifted in the supernatural arts. Rumors abound that he's not even human; people say his mother was a fox demon. He meets up with a court noble, Hiromasa: the two not only become friends, but the protectors of Japan's new capital. They have difficulties ahead of them, as Doson, the court's head onmyoji, secrectly plots against the emperor and his newly born son. The best anime analogy is Inuyasha, with its focus on traditional Japanese oni (demons) and kami (gods). Viewers familar with Mononoke Hime and Sen to Chihiro no Kamikakushi will see elements from these films - really elements of Japanese culture - in Onmyoji. Indeed, there is a lot of supernatural elements in Onmyoji: Hiromasa and Seimei do battle with evil spells, and the Onmyoji have their own familars, the shinigami. Some of these effects are pretty good, while others, like Doson's shinigami, a crow-like bird, look pretty hokey. Luckily, the bird is probably the worst special effect in the film; while there are a few other bad ones, there are some good visual effects too. It's certainly not Crouching Tiger, Hidden Dragon, but it does the job. Overall, the visuals are eye-catching, thanks especially to the elaborate and colorful court costumes all the characters wear. The sound is pretty solid, other than the fact that all the characters speak modern Japanese, but Pioneer made the choice to not subtitle the prayers uttered by the onmyoji; perhaps the speech was too fast. The DVD has an English audio track, which sounded reasonable, but watching a live action movie dubbed is worse than watching anime in English. The acting is pretty standard Japanese. Hiroyuki Sanada (Doson) is especially well known, as he was in Ringu, Ringu 2, and most recently, The Last Samurai. Mansai Nomura was in no less a film than Akira Kurosawa's last major period piece, Ran, and is famous in classical Japanese theatre. The film's pacing starts and stutters though. The pacing is slow, as are many Japanese films, but energizes in points. Often the action reaches fever pitch and it seems like the movie should end, but the film keeps going. Pioneer's release is everything a modern DVD release should be. Not only are there English and Japanese audio tracks, the DVD has a "Making of" feature, staff interviews, commercials, and a great special ending. This is a good amount of features for a film release. The only thing really lacking is information on Onmyoji 2; a trailer would have been great (but licensing could have kept Pioneer from doing so). Additionally, included with the DVD is a booklet that explains some of the historical aspects of the film and a cast of characters. It really helps with a historical film like Onmyoji. The film itself won numerous awards in Japan, and got glowing reviews from the L.A. Times and the Chicago Sun. In fact, it did well enough to get a sequel, but there's been little to no buzz about it on this side of the ocean amongst foreign film fans. That's a shame because Onmyoji plays out like a beautiful, supernatural fairy tale. The plot itself seems to hark back to classical myths and fairy tales in Japanese and Western history, and for us Westerners, on the outside looking in, the period adds an exotic nuance. 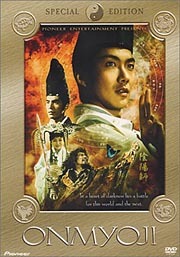 I'm a fan of period films and Onmyoji was exactly what I was looking for. It's not the normal blood and guts samurai or ninja fare, but for fans of historical dramas of any kind would do well to check out Onmyoji.